There are promising signs of progress in Somalia, but it still remains the country that first comes to mind when thinking of a failed state. The country has topped the annual Failed State Index listing for two decades since its disintegration into chaos after a coup overthrowing Siad Barre’s dictatorial regime in 1991, and ensuing the civil war that still carries on in some form to date. After the international interventions to stabilise the country and to address the humanitarian crisis in the early 1990s resulted in failure, Somalia was left to deal with it problems without assistance and for years it was not “… a state so much as a lawless, ungoverned space on the map between its neighbors and the sea.”[i]. The international community has only become involved in Somalia again in the last ten years or so, due to the urgency created by piracy flourishing off the Somali coast and the growing role of the extremist Islamist insurgency in the conflict. Today, the country hosts an African Union peacekeeping mission AMISOM and United Nations political mission UNSOM, in addition to three European Union missions – EUNAVFOR Atalanta for tackling piracy, EUTM Somalia to train Somali security forces, and regional EUCAP Nestor for maritime capacity building. There has been admirable progress considering the starting point, but much work remains to be done. Even though the majority of the Somali population does not live anymore in the middle of a conflict zone on a daily basis, the situation still continues to be complicated and it is difficult to comprehend all the aspects ranging from the clan divisions and al Shabaab insurgency to different levels of autonomous entities in the north and south Somalia. To add to all the internal complexities, the conflict has been characterized with external interventions by neighbouring Ethiopia and Kenya and the varying involvement of international organizations such as the EU, the UN and the AU. Somalia continues to face several challenges but the situation is slowly improving and for the first time in years there seems to be an optimistic view of Somalia’s prospects internationally. However, the recent demands by the parliament for the resignation of President Hassan Sheikh Mohamud demonstrate that plenty of internal problems persist. [ii] To stay on its way to stability, Somalia has to maintain commitment to institution building, especially in regard to security forces and judiciary, and to strengthen already established government structures as well as to keep control over its territory. To do so, it must defeat the insurgent group al-Shabaab that retains the ability to act within and from its territory and disrupt lives, especially in the central and southern parts of the country. The late May attack on the Somali parliament in Mogadishu[iii] demonstrates that despite having been driven out of major towns in 2011 and 2012, and the further territorial gains from the AMISOM offensive this spring, al-Shabaab maintains it ability to execute asymmetric complex attacks within the government and AMISOM-controlled areas. The federal government also has to decide how it will deal with the northern territories of Somaliland and Puntland of which the first has declared itself independent and the second autonomous, as well as configuring its overall federal structure. The struggles of the transitional and federal governments have been in contrast to the developments in northern Somalia where Somaliland has created a largely peaceful environment and established a fully functioning government that wants independence. Somaliland’s achievements should be applauded, but the federal government and Somaliland should decide together what the future holds. Any agreement between the two should be reached through negotiations to avoid further conflict. Since 1991, there have been several international interventions in Somalia. 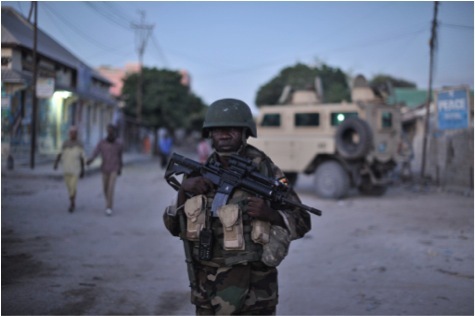 Despite their often good intentions, the international interventions in Somalia have often backfired by creating resistance within the population or initiating further insurgency by al-Shabaab. UN missions of the early 1990s are one of the most-well known failures of the world organisation and resulted in widespread reluctance to intervene in the conflict. Today, the AMISOM mission established in 2007 is the most significant foreign actor in Somalia as it has to large extent assumed the role normally belonging to the national security forces and police. The UN political mission in Mogadishu has only been in existence for a year and focuses on peacebuilding, whereas the EU missions have limited mandates focusing on fighting piracy and capability-building. The neighboring countries have played a critical role in the Somalia conflict and the consequences of their interventions have not been always constructive. Ethiopia intervened in 2007 as it became worried over the role of the Organization of Islamic Courts (OIC) and quickly defeated the organization. However, their intervention resulted in the more radical section separating from OIC that later became al Shabaab. More recent, Kenyan intervention has had more positive consequences as they have gained ground from al Shabaab, but the intervention has been largely motivated by self-interest and the creation of a stable buffer zone in south Somalia to prevent insurgent attacks in Kenya. Somalia should try to maintain the interest of international actors in its progress because it can use all the help it can get. Especially now that the federal government is becoming more efficient, any foreign involvement in Somalia should take place in consultation with the federal government and it should not be implemented against the opposition from local actors. The situation in large parts of Somalia is in reality relatively peaceful, with only few instances of occasional violence with the constant threat of conflict only existing in central and southern Somalia and especially in the capital Mogadishu. Only about a third of Somali population lives within the area most affected by the conflict and “[a]s tragic as this is, it is still a far cry from the universal reign of endless chaos often imagined.”[vii] The relative calm that has been created in the northern Somalia has been a result of efforts by Somalis themselves and thus the international community should look there for lessons learnt and focus their efforts to building the local capabilities. If Somalia continues on a path of consistent progress, it might eventually lose its spot at the top of the Failed States Index. However, it will take time to address all the problems created by the decades of conflict and lack of state institutions. Stability is needed not only for strengthening the state institutions but to encourage foreign investment and enable the reconstruction of the country. It seems that finally there is a light at the end of the tunnel for Somalia, and a cautiously optimistic view should encourage international actors to remain involved and help the Somali government to keep working on institution-building and security sector reform. This entry was posted on 09/06/2014 by ISIS Europe in Behind the headlines, Contributors, Saara Ilmonen and tagged al-Shabab, AMISOM, Capacity-building, civil war, CSDP mission, EU NAVFOR Somalia, EUCAP NESTOR, EUTM Somalia, humanitarian crisis, institution building, Somalia, Somaliland, UN.